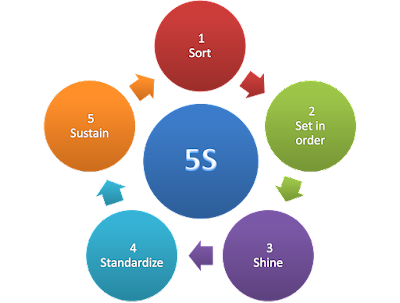 The 5S philosophy focuses on effective workplace organization helps reducing waste. Seiri (sort) to put things in order. Seiso (clean) keeping things clean and polished in the workplace. Seiketsu purity and focuses on maintaining cleanliness and perpetual cleaning. Seiri means sorting through everything in each work area. It requires keeping only what is necessary. Materials, tools, equipment and supplies that are not frequently used should be moved to a separate, common storage area. Items that are never used should be discarded. This makes it easier to find the things needed and frees up additional space. This is the next step. It requires organizing, arranging and identifying everything in a work area for efficient retrieval and return to its proper place. Once everything from each individual work area to the entire facility is sorted and organized, it needs to be kept that way. Seiketsu ensures that the first three steps of the 5S programme continue to be effective. The good practices developed in the first three steps need to be standardised. This implies continuous training and maintenance of standards. The organisation must build a formal system for monitoring the results of the programme. A follow-up is a must for the above four steps to continue to be practise.